How to Make the Future into What You Want It to Be is a thoughtful argument for individuals to be more proactive in securing their own happiness. 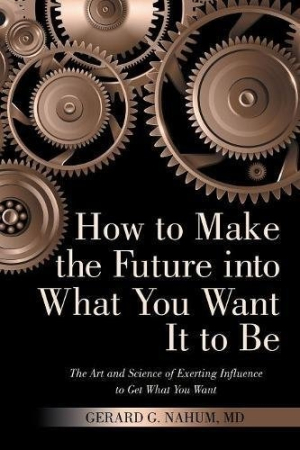 In his treatise How to Make the Future into What You Want It to Be, Gerard G. Nahum breaks down the means of effectively managing the present in order to shape the future, outlining all the ways in which people sabotage their own paths. This book is full of profound tidbits of knowledge, such as the fact that the present has already happened, and therefore is a fait accompli. It makes the striking argument that people can accurately predict their future by designing their present, and can do so along the lines of a helpful chart depicted in early pages. How a person characterizes their present, especially in regard to goals, is shown to be a good indicator of future events. The book dispels the idea that there is randomness in human lives. Rather than dealing with notions like fate, it treats life as having mathematical qualities. The book’s main thrust is that there is a science to our existence. The volume is divided into thirteen chapters with several appendixes. The chapters contain generalized knowledge and solutions to the problem of the future, while the appendixes focus on specific mathematical and philosophical theories (chaos theory, for example). These chapters flow well together. The writing is plain but eminently consumable, and the book’s logic is sound enough to make its case compelling. Centered on the notion that everyday people can learn to predict their futures, the book consistently builds a case for greater human agency, insisting that if people understand their predicaments fully, they will be better equipped to predict and alter outcomes. Most of the critical arguments are easily applicable to everyday life. Not all will be compelled, and the book even risks alienating its audience at times—especially since it implies that “bad luck” is nothing but a euphemism for bad choices, a bad mindset, and incomplete knowledge about consequences. There are self-help elements at play here, but conclusions are not entirely positive; if a person’s happiness and success are up to them, then by extension, any failure is also of their own doing. With its combination of philosophy and self-help elements, How to Make the Future into What You Want It to Be is a thoughtful argument for individuals to be more proactive in securing their own happiness.